PureDry ensures waste fuel oil recovery and sludge minimization. PureDry is a fully automated, modular system designed to treat and recover valuable oils found in sludge onboard ships and in power plants. The system separates the waste oil into three phases: cleaned oil, water and super-dry solids. PureDry cuts the cost of waste oil and solids handling by removing water from the waste oil and concentrating the solids to super-dry sludge (typically 5-15 kg/24 h), thus eliminating oily waste and related disposal costs. The efficiency of the system in terms of drying up oily waste streams means holding tank volumes for waste oil and waste water can be reduced, thus freeing up valuable space on board a ship or in a power plant. Furthermore, waste fuel recovery is possible when FO waste are separated from LO waste (separate waste oil tanks) – fuel saving up to 2 % is possible. The uniquely simple separator design ensures easy, reliable operation. The system separates the waste oil into three phases: cleaned oil, super-dry solids which can be disposed of as dry waste, and water clean enough to be sent to the bilge system. Smart automation adapts the process control to varying feed conditions. There is no water consumption and no additional waste generated. The compact PureDry system comprises a pumping module with emulsifier dosing unit, a heating module, a separation module and a control unit. Its modular design provides flexibility for installation in any convenient location and makes it easy to integrate with existing onboard systems. PureDry is supplied with an Exchange Kit, which includes a new separator insert (rotor and disc stack), a new XCavator, and a consumables kit. After one year, the crew replaces the separator insert as simply as replacing the insert in a filter, also replacing the XCavator. The used parts are returned to the nearest Alfa Laval Service Center, and the ship orders new Kits. 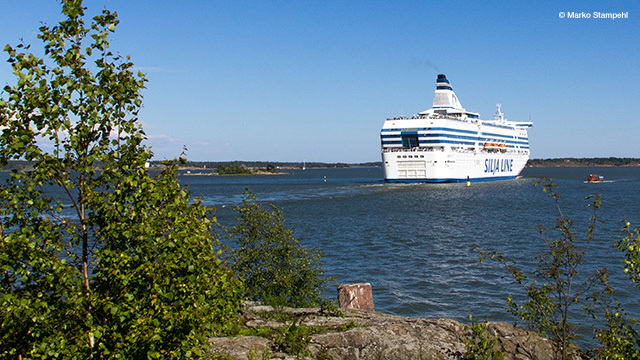 In combination with Alfa Laval’s PureBilge system, PureDry forms a complete, integrated waste oil/bilge water treatment solution that can dry up all oily waste streams on the ship or in the power plant. PureDry separates out the oil, concentrates the solids to super-dry sludge which can be landed as dry waste, and sends the water to the bilge system. PureBilge then takes care of the fine polishing of the oily water prior to discharge overboard. 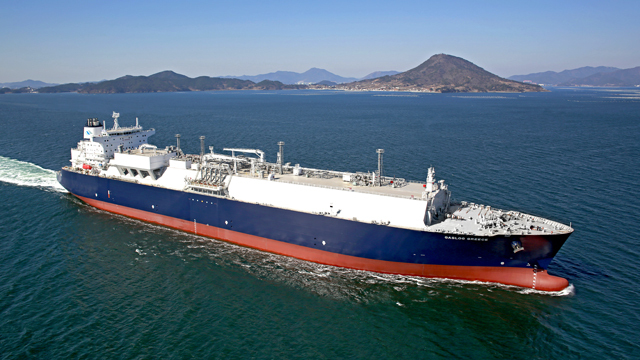 GasLog Ltd. is an international owner, has chosen to equip three upcoming newbuilds with Alfa Laval PureDry. 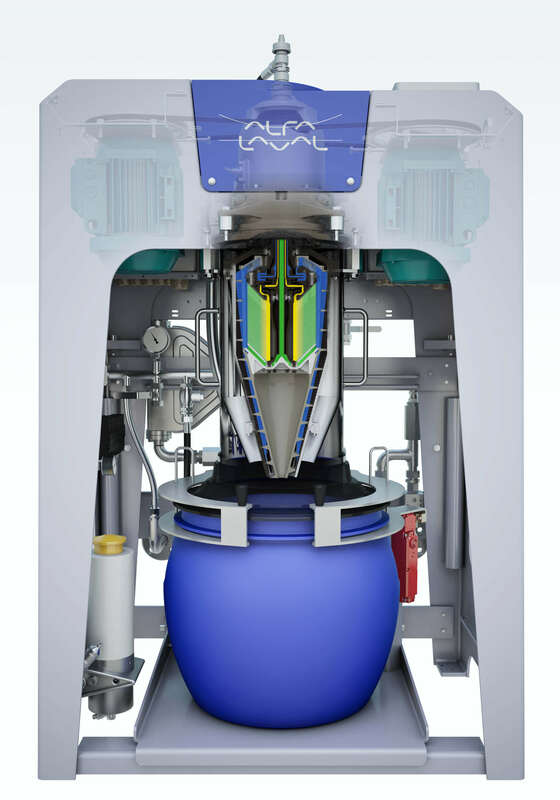 Alfa Laval recovers all reusable oil from oily wastewater and cuts waste disposal costs. 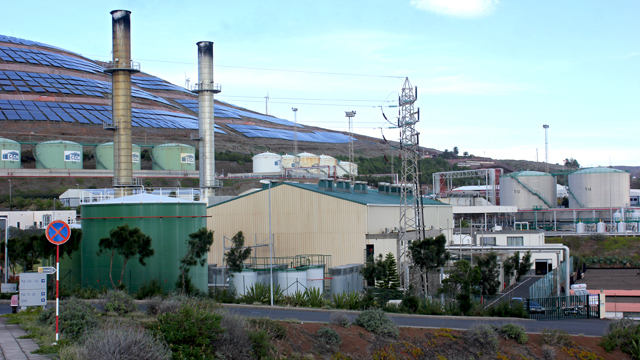 The PureDry oily waste treatment system continuously processes oily waste, separating oil, water and solids. It comprises a pumping module with dosing unit, a heating module, a separator module and a control unit. The separator bowl containing a disc stack rotates at high speed and solids from the waste oil feed accumulate at the periphery. From the periphery the solids are continuously discharged by a patented spiral-shaped device called the XCavator into a container under the separator. The amount of solids accumulated in the container is continuously monitored by means of a load cell. An oil paring disc, which forms part of the separator bowl, continuously discharges recovered oil from the separator through the oil outlet under pressure. The oil is directed to the oil recovery holding tank. A built-in water paring disc continuously discharges separated water through the water outlet. Although sealing water is added to the bowl during start-up, no more water needs to be added, thus no additional waste is created by the process itself. The system operates at flow rates of up to 500 liters per hour. A positive displacement feed pump operating at a constant ﬂow directs the waste oil to the system. The process liquid then passes through a duplex strainer, which traps large particles, into a pre-heater. For optimum separation efficiency, the heater raises the temperature of the unprocessed liquid to the desired feed temperature of 95°C. A three-way changeover valve directs the waste oil to the separation stage if all process conditions, such as feed temperature and feed pressure are met. During an alarm situation, loss of operating pressure, power failure or when any preset condition is not met, the valve re-circulates the ﬂuid back to the waste oil tank. The water is then transferred either to the bilge water treatment system for further processing to ensure that it meets IMO standards for discharge overboard, or back to the waste oil tank, according to the process conditions. 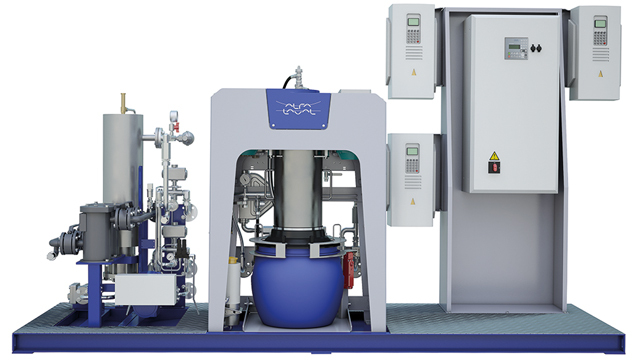 To enhance performance in the presence of stable emulsions, a demulsifier dosing unit is included. The unit is connected before the pumping stage in order to mix Alfa Laval demulsifier directly into the feed. The process is continuously monitored and controlled by the EPC 60 control system for fully automatic operation.